On your adventure to save Kuro, the child you were sworn to protect in Sekiro: Shadows Die Twice, you’ll have to make some decisions. Players have the freedom to go about their quest as they see fit, with these decisions leading you to one of four different endings. If you’re looking to see every outcome and earn all trophies and achievements, here’s how to get all endings in Sekiro. 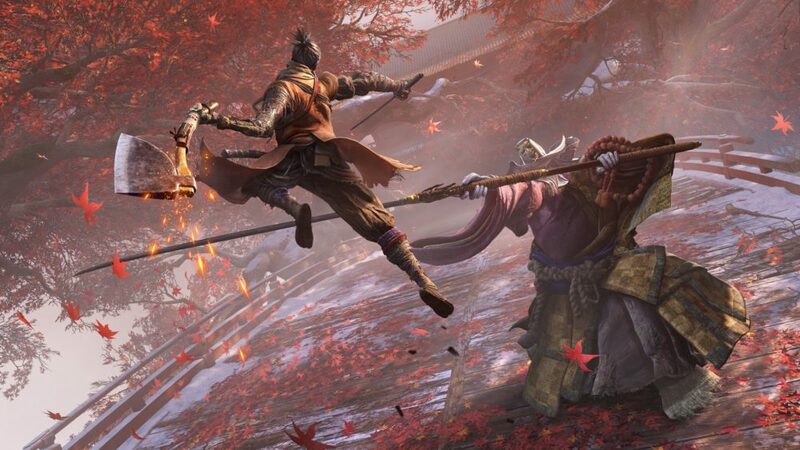 As we previously mentioned, there are four different endings you can get in Sekiro, each of which requires you to do slightly different things on your adventure. Down below you’ll find quick and easy sections to help you figure out what you need to do to get all endings in Sekiro. So, without further ado, let’s dive in. Once you’ve beaten the Guardian Ape and purple Corrupted Monk in Sekiro, you’ll notice that the Idols are no longer available. As such, make your way back to Ashina Castle and you’ll come across the Great Shinobi Owl sitting on the rooftop. This is the point where you’ll need to choose to obey either Kuro or the Owl. To get this one of Sekiro’s endings, rather than deciding to obey the Great Shinobi Owl at Ashina Castle, instead side with Kuro. You’ll then need to take on the Owl himself, who’s a formidable opponent, so be prepared for a tough challenge. Once the Great Owl is taken care of, simply continue playing through the game. You’ve still got a few more bosses to take care of in a different area, but soon enough the credits will roll and you’ll get this ending. At least you stayed true to your oath and served Kuro at all costs! Very much like the Immortal Service ending in Sekiro, to get the Purification ending, you’ll need to first take care of the Great Shinobi Owl atop Ashina Castle after defeating the Guardian Ape. This time around, though, you’ve got to follow some pretty specific steps, rather than just continuing on your adventure. We’ve broken these out down below. You’ll first need to head to Isshin’s home. You can get here by following the smoke signals on Ashina Castle Roof. When you get here, eavesdrop on Isshin and Emma’s conversation. Take a quick rest and then head to Kuro’s room. You can eavesdrop on him by standing around the corner in his room. Now go rest again, and then head up the stairs to go and speak with Emma. You’ll talk about Kuro and all you need to do here is agree with her. Rest again and then start another conversation with her. Now you’ll need to make your way to the Old Grave Idol. Save yourself some time and fast travel to it. Surprise, surprise, you’re going to talk to Emma again here. Fast travel to the Sculptor Place Idol. Hide behind the building and eavesdrop on Emma and the Sculptor. Once you’ve finished listening in, go and confront Emma about what you’ve heard. She’ll hand over a bell, which can be used at the Buddha statue. Upon finishing these sets, it’s simply a case of continuing on with the rest of Sekiro’s story from here. This may seem like Sekiro’s most convoluted ending. Unfortunately, you haven’t seen anything yet. The last of Sekiro’s endings, the Return ending, once again starts off from that Great Shinobi Owl decision you’ve got to make. For this ending, as you’d imagine, you want to stand by Kuro and face off against the Owl. Head to the Senpou Temple and go to the Temple Grounds Idol. Dive in the water by this Idol to get the Infested Scroll. Alternatively, you can get this item by talking to the monk next to the Main Hall Idol if you’ve not yet beaten Genichiro. Go and take some rice from the Divine Child. Give her the Infested Scroll at this point to avoid risking this quest bugging out on you and blocking you from seeing this ending. Now begin taking rice from the Divine Child, eat it, and then rest at the Idol to reset this area. That way you can continue to get more rice from her until the next step. You’ll then reach a point where the Divine Child will ask for a Persimmon. These can be gotten from the Senpou Temple Memorial Mob, so go grab one and bring it back to her. In return, she’ll give you some rice to give to Kuro. Go and do just that, and then return back to her. She’ll have moved, so head to the Halls of Illusion (where you fought the Folding Screen Monkeys). The Divine Child will now tell you that you need to get a tome from a monk. Head to Senpou Temple’s Main Hall Idol and you can find the tome by a dead monk in the entrance of the cave nearby. Take this back to the Divine Child and she’ll now ask you to get the two serpent hearts or ‘fruits.’ These are the Dried Serpent Viscera and Fresh Serpent Viscera. See two points below on how to get each of these. Dried Serpent Viscera – Head to the Sunken Valley, Bodhistavva Valley, and head in the opposite direction of where you fought Guardian Ape. Go down and head right and you’ll come across a poisonous bog (because of course we do in a From game). Head inside the cave until you find a trader. At this point, find the entrance to take you deeper into the cave where you’ll find The Great Serpent. Follow the path until you find its head. Use the Puppeteer Ninjutsu on the monkey to the left, distracting the snake. Head through the door and pick up the Dried Serpent Viscera. Fresh Serpent Viscera – For this one, return to the Senpou Temple and head to the right of the first Idol in this area. You’ll now drop down and should be able to see an enemy you can use Puppeteer Ninjutsu on. Do just this and he’ll start using the kite. Follow this path around until you can grapple onto the kite. Once you’ve done this, you’ll be taken straight to a new area where you can kill the Giant Serpent. Defeat it and you’ll get the Fresh Serpent Viscera. Return to the Divine Child and give her both of these serpent fruits. Rest up a couple of times and return to talk to her again. She should now give you the Frozen Tears item. Once you’ve got the Frozen Tears from the Divine Child, it’s then simply a case of playing through Sekiro’s main quest until you reach the ending. This will trigger the ‘Return’ ending, and you’ll get the trophy or achievement titled the same thing. That’s all you need to know on how to get all endings in Sekiro. For more tips, tricks, and guides, be sure to check out our ever-expanding Sekiro guide wiki.